The Woman Next Door tells the story of two women in South Africa - one black, one white. They're next-door neighbors and they hate each other. Marion, the white woman, is casually racist and not self-aware, so she doesn't realize she's racist,, although it shows in even the little things she does. Like buying one-ply toilet tissue for her housekeeper and two-ply for herself (until she finds out the housekeeper is buying her own three-ply and rushes out to get some of her own). Hortensia, the black woman, has become hardened since her husband's affair, 40 years back. When Marion finds out she's going bankrupt and will have to sell her home, she digs in her attic for a valuable painting purchased specifically as an investment. She wants to hide it from the bank because it's valuable enough to at least keep her in a decent home for the rest of her life. When Hortensia's husband dies and the will instructs her to call her deceased husband's daughter from his affair, she resists and starts on a project to remodel her house so she won't have to think about it. But, there's an accident on the first day. Hortensia's leg is broken and Marion's home is damaged. The painting disappears. They still hate each other, but through shared tragedies, the two women slowly get to know each other and share their broken pasts. Highly recommended - I adored the characters. They're both nasty in a curmudgeonly way, having been broken by life, somehow. But, at the same time, you can't help but be utterly charmed by their dialogue. The story really is a delight. I chose to read The Woman Next Door because of the word "delightful" on the cover, having just finished a suspense. It was absolutely the perfect follow-up to a darker read. I think The Woman Next Door would also make a pretty good discussion book. The racism and misogyny experienced by the two women should be excellent fodder for group discussion. I'm just going to admit how I felt about Pretty Girls up front so you can decide if you want to read on. When I finished the book, I was taking my blogging break but still writing quick reviews at Goodreads. I opted not to give it a rating at all because I disliked it so much. However, if I were to rate the book only on the quality of writing, I'd give it a 4/5. Karin Slaughter is clearly a pro. Her characters were nicely fleshed out and some of the women were very clever, with terrific senses of humor. I found myself wishing the author would use her skill to write something less gruesome. However, the storyline is about men (not just one) who torture women to death, a woman who finds out her husband was evil, and a family in which loss and not knowing what happened to a missing daughter/sister has torn them asunder. Had it not gone into such graphic detail about the torture and murder of kidnapped women and instead been the story of a family working together to solve a decades-old crime without the gore, I might have been okay with it. I was quite impressed with the author's skill in storytelling and characterization - and I loved the dialogue between them. Most of the family had a dry wit, so when some of the characters were interacting, the dialogue was often quite fun. Having said all that, I just can't handle this kind of book and a part of me desired to rate it 1/5 just for being so damned revolting. I considered giving up around page 225 or so. The only reasons I continued: I wanted to see it through so I could know that the worst of the evil men would never hurt anyone again (it was predictable that something would happen to him in the end) and read the resolution in which the family finds its answers. And, yes, those two aspects were satisfying. Not recommended unless you have a really strong stomach - If you can handle horrifically graphic detail, great. If not, avoid this book. The torture was just too much for me. 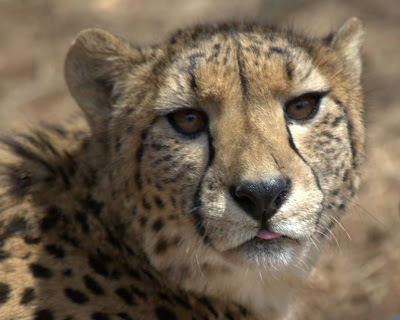 I will not read Karin Slaughter, again. 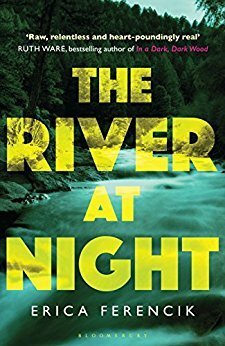 I had a little trouble getting into The River at Night, partly because I had just finished three utterly brilliant books in a row (this was back at the end of July) and partly because the beginning is a bit slow. A suspense about 4 women who get together yearly for a getaway, the book begins with a concept that's a little hard to buy into. Pia wants to go somewhere remote and challenging - a "get back to nature" type of trip - and she's chosen whitewater rafting in Maine. Rather than finding a place that's safe with trained tour guides, she's found a 20-year-old who has mapped out a remote section of river in Maine that he'll guide them down after a night of camping in the wilderness. Win (short for Winifred) narrates the trip. There's some painfully overdone foreshadowing via Win's fears, at the beginning. But, once the women arrive at the river and begin their journey, the pace of the story picks up. Rory, their guide, seems competent enough. There was just never a point at which I was able to say to myself, "Yeah, sure, I believe 4 women would be willing to go to this remote area with a single guide and no knowledge of their own." It just didn't make sense to me. Why not go somewhere safer? I've been whitewater rafting. You can choose a trip every bit as challenging as what Pia chose (a weekend trip) but without the added danger of going somewhere so ridiculously remote without any kind of emergency plan. It's almost like you can sense the author plotting, "Where can I send my characters to make sure they're in the worst possible situation?" Setting up the plot in this way ensured that the characters in the book fall into the "too stupid to live" category. Recommended but not a favorite - The author did a great job of changing the scenery, keeping the geography fairly fresh as the group traveled downriver; her descriptions of the river were beautiful. And, once things started to go horribly wrong and the storyline in The River at Night went a little big Deliverance, I considered the challenge the women faced unexpected and therefore interesting. I give the author credit for uniqueness of the specific dangers she created and the fact that I did find the story suspenseful, if a bit predictable. But, the overall result was average to a bit above average. Points off for overdone foreshadowing and a story that never fully allows one to suspend disbelief. This is a new favorite image. 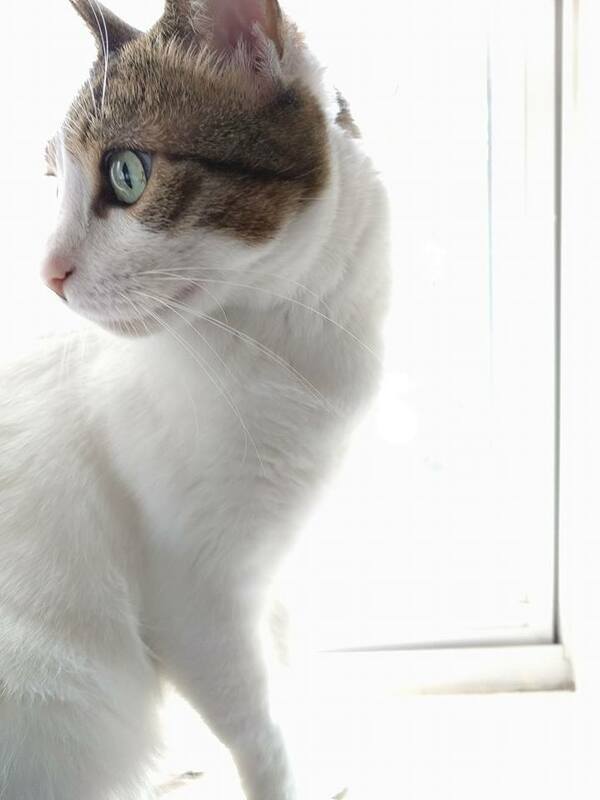 I discovered that if I get the phone camera to focus on Izzy's dark bits (her eye or the tabby patches on her face), the camera will overexpose everything else when she's in the window, giving a photo a stylish, edgy look. She had no idea she was modeling. Should I pay her in treats? Noor's Story: My Life in District Six by Noor Ebrahim is a book I bought in Cape Town, South Africa when we went on a tour of District Six, Langa township, and Robben Island (the island on which Nelson Mandela was imprisoned for 18 years). The District Six Museum is pretty much all that's left of the once-thriving community in which Ebrahim once lived. The name "District Six" has to do with the fact that Cape Town was once subdivided into districts and it just happened to be the sixth district. There's nothing particularly special about the name. But, the district was unique in that it was a melting pot, its residents diverse but living vibrant lives in harmony. In the 1960s, the residents of District Six were informed that their district had been designated an area for whites only and that they'd have to move. However, nothing happened for nearly a decade. Life went on as usual until the government finally got around to forcing people out in the 1970s. And, then they literally bulldozed almost every building. 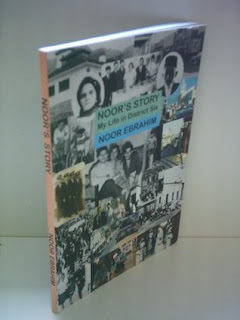 In Noor's Story, the author talks about his childhood and young adulthood in District Six. Although his family was impoverished, they lived a happy life and always knew that if they were short on money, they could ask the neighbors for a little help and count on them to provide a little bit of bread or vegetables. They would never starve. The district was self-reliant, so while some of the residents commuted to other parts of Cape Town to work, they had everything they needed in District Six - food, schools, churches and mosques, a theater, etc. Noor had a variety of interests including athletics and choir. He talks about various holidays, religious and otherwise, and the parades that everyone looked forward to. And, he tells about how and why he gave up his schooling and sought employment to help finance his siblings' education. The sad part, of course, is the destruction of the district and the way the community was divided as everyone was forced to move. For some, life was never even remotely the same. Once that community was gone, many of its traditions and connections disappeared, as well. Those who lived in District Six will tell you they believe the district was destroyed because it served the government's purpose to have people of varying backgrounds divided. Apartheid still existed and whites could only stay in power if they encouraged division. Trevor Noah made similar comments about the way blacks were divided into differing factions during Apartheid. It's fascinating and definitely a lesson worth studying. Highly recommended - If you're interested in what life was like in this unique community, I definitely recommend it. I found myself looking up a lot of words that were unfamiliar (or looking them up again if I'd read them, before - "koeksisters", for example, are a confectionary that looks much like our donuts and I read about them in another book but promptly forgot the word). While sometimes I couldn't find a definition, I found reading about the community so enjoyable that I just shrugged it off and continued when that happened. No biggie. The bottom line was that District Six was a place where people of different colors, religions, and backgrounds lived in joyful harmony. I loved immersing myself in Noor's world. Cassandra Harwood lives in 19th-century Angland, where men work as magicians and women are in charge of politics. But, Cassandra has never fit into any mold. 4 months after Cassandra tragically lost her ability to cast spells, she has accompanied her brother and sister-in-law to a gathering in the elven dales. But, even as they were traveling, they knew something was wrong. The unseasonably harsh snowfall has continued, leaving them snowbound. Not all of the guests will be able to arrive. And, Cassandra is in deep trouble. During the search for missing members of the party, she uttered a few words overheard by a manipulative elf lord, words that committed her to a task. Obligated to find out who caused the strange change of weather, Cassandra will suffer a horrible fate if she fails. While Cassandra searches for answers she must also deal with the presence of her former fiancé, who still does not understand that she left him for his own good. Will Cassandra discover the answer in time to save herself from the wily elf lord? What will happen between Cassandra and Wrexham, the man she still loves but desires to protect? It took me a couple chapters to figure out exactly what was going on in Snowspelled and really get into the book. And, then I was unsure who the audience was meant to be, since Stephanie Burgis writes across age ranges and the book is quite short at a mere 153 pages. After I arrived at a scene that was very adult, I decided I'd better ask. The author confirmed to me that Snowspelled is an adult fantasy novel, hence the recommendation for a specific crowd in my labels. There are no particularly graphic scenes so I wouldn't worry if a child walks off with your copy, though. The "adult" bits are limited to a bit of innuendo. At any rate, once I got into the storyline, I really enjoyed it. There's a great cast in Snowspelled but even though Cassandra (called "Harwood" by her former fiancé) is staying at a large estate with a sizeable cast of characters, you only get to know those who are entirely necessary to the plot; the author doesn't overwhelm you with characters (much appreciated). And, I particularly loved the characters who were closest to the heroine. Brother Jonathan is a bit of a rebel, himself, and sister-in-law Amy is quite simply delightful. Ex-fiancé Wrexham is the kind of man you really want your heroine to fall in love with. And, the ending scene is both clever and satisfying. The story is fully wrapped up, no cliffhanger ending. Highly recommended - A quick, delightful read, first in a series, that is both romantic and adventurous. Read it for a change of pace, a touch of magic, a taste of romance, especially if you're looking for a light, charming read to break a dark mood or a slump. I found myself smiling a lot and I was definitely in the mood for something light since I've been a bit slumpy, post-vacation. 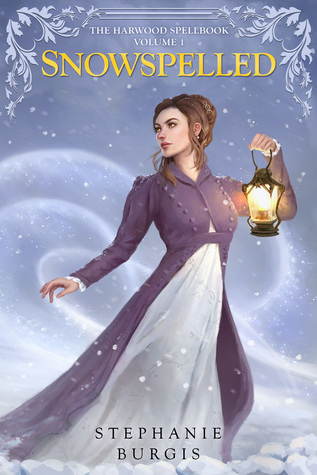 Lucy Stanhope is a wicked young lady with icy manners and The Way to London is a romantic quest. Lucy is a wounded soul because her mother never paid attention to her and flitted from one romance and marriage to another. The story opens in Singapore, where Lucy's scandalous affair with an exotic man has come to light. 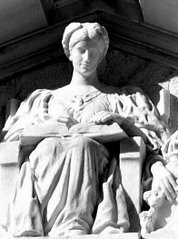 She's pressured to return to England by her mother and stepfather, who are concerned that her affair will damage her stepfather's business. But, Lucy is unhappy in her aunt's huge estate in Cornwall, where soldiers are billeted and Aunt Cynthia expects Lucy to abide by strict rules and standards, yet is also too busy to spend any time with her. Then, Lucy meets a 12-year-old boy named Bill who has been evacuated from London. Bill is frustrated with the family who took him in and wants to return home to London's East End. Lucy has heard there's a Hollywood filmmaker in London, a man she met in Singapore, and she wants to see if she can become his next starlet and escape England and the war. So, Lucy and Bill decide to travel to London together. The war interferes with their travels and they meet a number of challenges. Along the way, they meet up with another acquaintance of Lucy's, a former soldier she met in Singapore who was released for medical reasons. He sees through Lucy's caustic personality - even thinks she's kind of funny. Can Lucy accept the fact that she may be falling for a man who is neither wealthy nor exotic? Or, will she stick to her escapist plan and attempt to become a starlet? Highly recommended, particularly to lovers of romantic adventure - The Way to London is very plot-driven, which I love, but I think what I liked about the book most is the way Bill softens Lucy. The relationship between the two is a little odd and a lot heartwarming. There are other people who add to the sweetness of the story as they help Lucy and Bill through challenges, as well, giving the book that sort of "hodge-podge family" feature that I adore. Because Lucy's wounded soul is reflected by her rebellion and biting personality, she requires a good bit of patience. 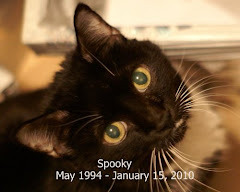 But, eventually, she does redeem herself, the story is worth sticking out, and I closed it with a warm, fuzzy feeling. I really loved this story. This was not a big week for reading or arrivals, even though I enjoyed the reading that I managed. 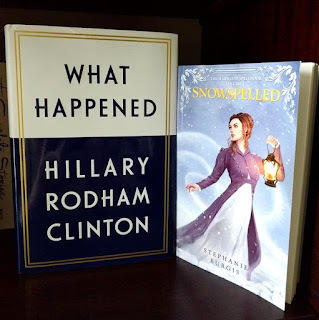 I enjoyed both of these books. 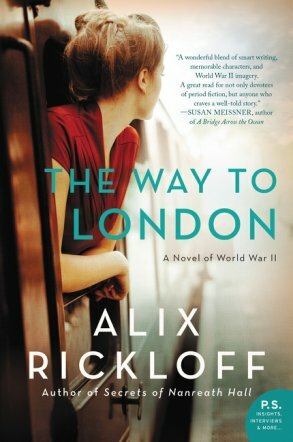 My review of The Way to London has been pre-scheduled to publish tomorrow. Since I'm so far behind on reviews, I figured I'd better write about it while it was still fresh in my mind. I hope to do that for Snowspelled, as well. It's going to take me a while to catch up on the backlog of reviews but I'm not worried. If I have to, I'll do a few catch-up mini review posts and I'm planning to do a children's book review week, soon, as well. OK, this is misleading. I'm really only reading An American Family - and definitely enjoying it. I meant to use the hashtag #ConstitutionDay to mention how much I enjoyed reading about how Khizr Khan discovered the American Constitution and his appreciation of it, yesterday, but I blew it. It's a good story, though. 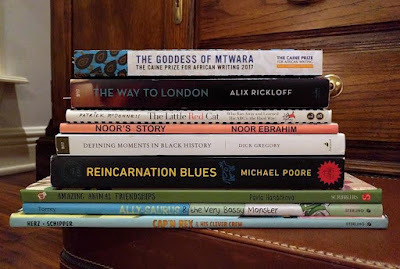 I haven't touched The Goddess of Mtwara since I got home from vacation, although I love the variety of stories in this book of African prizewinners and haven't given up on it, by any means. And, I got 50 pages into The Invention of Wings but then didn't open it back up after the first night's reading. I was enjoying it but I'm not going to make it to my F2F discussion so I just haven't felt compelled to pick it back up. I think, instead, I'll read it another time and start one of my ARCs, since I have a substantial pile of them to tackle and I keep looking at those ARC piles longingly. Huh, can't think of any other news. We had some fall weather (really, closer to winter weather with a high in the mid-50s) just after we returned from vacation but we're back to normal, now (upper 80s, low 90s, heavy humidity) and I am definitely missing that cool weather. It was fun while it lasted. The news fades quickly but you never forget living through a devastating hurricane, so I've been thinking a lot about those who are recovering from Hurricanes Harvey and Irma and hoping that the punishing experience of living without power in the Southern heat has ended for most. I'll be keeping the hurricane survivors in my thoughts for a long time. This was adorable. 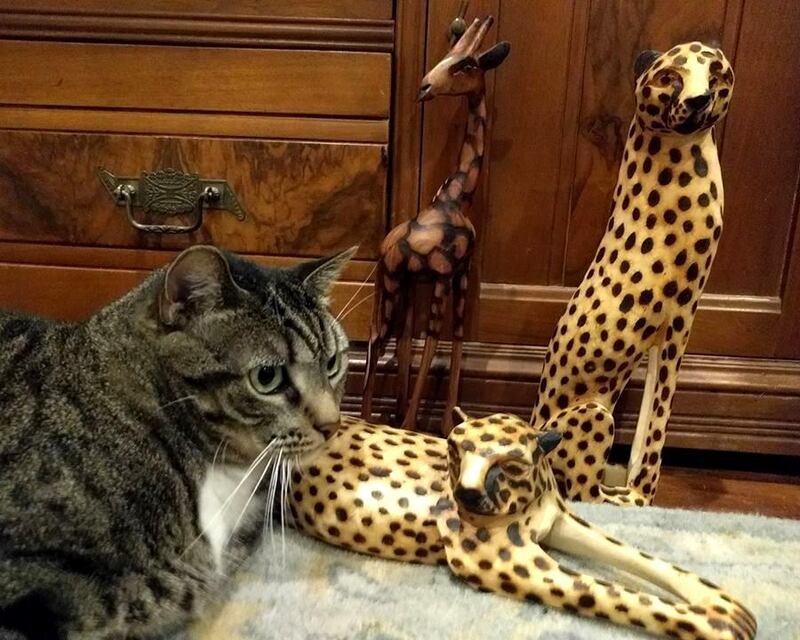 Fi was rubbing against the wooden carvings we brought back from S. Africa. Thank goodness she did something cute. It's the first time I've managed to take a cat picture since we got back from vacation. I was starting to worry that I wouldn't find a decent photo for Fiona Friday. The Salt Line begins with a group of people who are preparing to go on an expedtion. The world is dystopian, a near-future world in which a deadly tick has caused the United States to be subdivided into zones. The characters we're following are mostly wealthy people from the Atlantic Zone who are going to an Outer Zone in the region that used to be known as the Smoky Mountains. In this future world, people are presumably crammed into cities in the regions that are safe from tick infestations and have little to no exposure to nature. Some zones only experience periodic outbreaks but that's enough to make their inhabitants poorer, their zone less desirable and populous. We get to know the characters while they're doing their training. Edie is a former bartender who is partnered with the man she's been dating, an online pop star named Jesse. Wes is a fabulously wealthy tech start-up genius who came up with what I presume is a banking system and his partner (on the expedition, each has to have a partner to "stamp" them in the event of a tick bite) Marta is the wife of a mob boss with political aspirations. There's a brother and sister, a married couple who are both lawyers, and some others who have lesser roles. Tia and Andy are their guides. After the training, the participants don suits that are designed to protect them from ticks and hike to their first campsite. At this point, I was still convinced I was reading a survival story. But, not long after, there's a surprising plot twist that changes the entire character of the novel and the question is no longer, "Will they survive the dangerous Outer Zone or will some die of Shreve's, the deadly illness carried by the ticks?" but "Will anyone survive?" There is some violence and plenty of deaths but fortunately The Salt Line is not too gory, although there is at least one totally gross infestation in which the ticks reproduce and then explode out of one of the adventureres' skin. Ewww. I found The Salt Line riveting most of the time, but there were moments of exposition that I found tiresome. I'm not sure I always needed that extra bit of character development that came via flashbacks and storytelling by characters. But, that was one of only two complaints I had. The other was the fact that I did have a little difficulty buying into a world in which an entire country had been subdivided on the basis of the presence of a disease-brearing tick. Granted, the author did explain that there was no foolproof defense - no preventive cream or suit had a 100% success rate and the ticks burrowed so quickly that even using the so-called stamp that pulled them out and burned the eggs was no good if you didn't act fast. Would that be enough to drive people into the most crowded regions to survive? I don't know. It felt like there needed to be some other driving factor to explain the mass migration. Regardless, I enjoyed the reading, the uniqueness of the world building and storyline, the character development (bearing in mind that there were a lot of characters and not all were in need of the same depth of treatment), and the surprising plot twists. There were a couple major plot points that I anticipated but I didn't find the book generally predictable so they were not bothersome. I did sense the author's presence in the "Who will live and who will die?" aspect. But, she did a good job of developing characters with flaws, some more likable than others, and I liked where she took the characters who were the kindest. 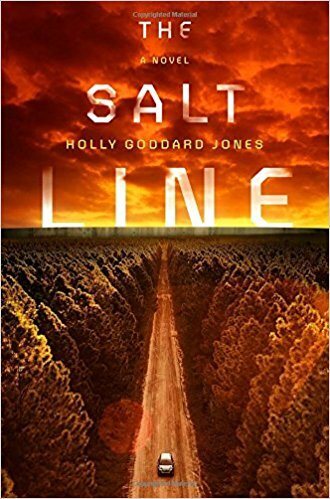 Recommended - Surprising in many ways, The Salt Line is a very good read with well-developed characters, unique world-building, and an unusual storyline that shifts dramatically, partway in. I will be looking for more by this author. I purchased Woman at Point Zero to read as part of my personal Feminist Reading Challenge after reading an award-winning author's description of it as one of her all-time favorite books. A book described as "fictionalized nonfiction", it tells the story of a woman who grew up in Egypt and was calmly awaiting her death when the author met her. It's a rough read and hard to even think about, but when I wrote about it at Goodreads, I felt like I needed to spill. What happened to the subject of this book, Firdaus, happened because of the culture in which she lived. And, she was tough but it was a horrible life. My review may contain spoilers. Please don't read it if you're concerned about spoilers. Firdaus grew up poor, with a father who insisted on being fed every night, even if that meant the rest of the family starved, and an uncle who would stick his hand up her skirt while he sat beside her, reading. After her parents died, Firdaus moved in with her abusive uncle and eventually was sent away to boarding school, where she proudly received her secondary school certificate (the equivalent of a high school diploma). When she returned to her uncle's home, she overheard him saying he didn't want to spend the money it would cost to send her to university. Without a university education and with nobody to recommend her, Firdaus had few options. She tried to make it on her own and was repeatedly raped and abused. She learned to dissociate when she was forced into prostitution. She tried working a regular job and found herself constantly sexually harassed and even poorer than she had been as a prostitute. Eventually, she killed in self-defense. By that time, she was well aware that the odds were stacked against her and always would be. She was ready to die and rejected offers to help her escape the death penalty. I found Firdaus's story shocking and powerful. Have things changed in Egypt since the book was published in 1976? Are women still routinely abused and held back? I don't know. It was not that long ago that American reporter Lara Logan was shoved to the ground and sexually assaulted in Egypt, so I'm guessing the answer is no. Woman at Point Zero is a stunning story of how a lack of education and resources combined with dangerous misogyny can create a society that perpetuates its own horrors. A stirring reminder of why women in the Western world must keep fighting to maintain and expand our rights to equality and the ability to choose what happens to our bodies. Highly recommended - I gave Woman at Point Zero 5 stars but on reflection I think I'd lower it to 4 stars, if only because I recall the dreamlike quality of the writing; it's beautiful but the story is brutal. That is a style issue, though, and I liked it as I was reading it. The subject matter is powerful as it shows just how dangerous it is to let men dictate how women are treated. When women don't have a say, they're less likely to be educated, more likely to be abused, less likely to be able to find a way to support themselves and live independent lives. Firdaus was simply doomed to a horrible life, no matter what she did to try to improve it. 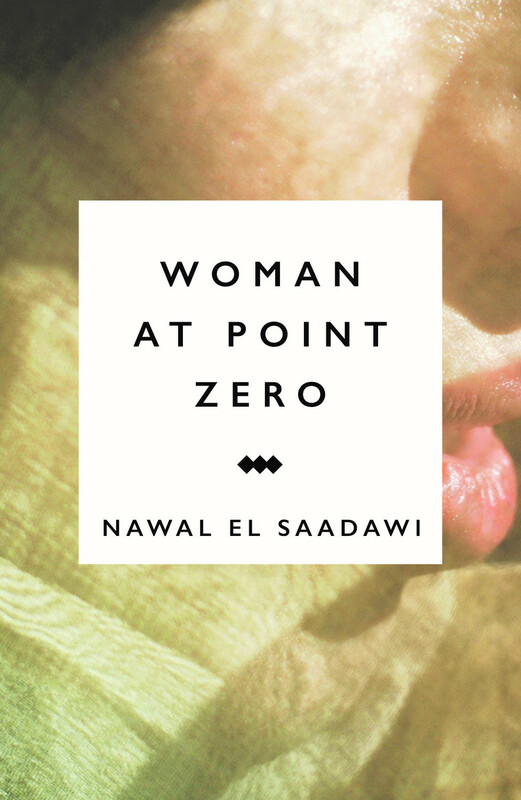 Difficult as Woman at Point Zero is to read, it's a thought-provoking book that gives insight into what a male-dominated society in which abuse of women is commonplace looks like. If you've experienced sexual assault and are easily triggered, I recommend avoiding Woman at Point Zero. I have a feeling it could send even the hardiest survivor into a depressive tailspin. It's late Monday night and I just realized I keep forgetting to finish this post so I'm going to turn it into a Tuesday Twaddle. I think I managed to gather all of the remaining books together. I sure hope so! 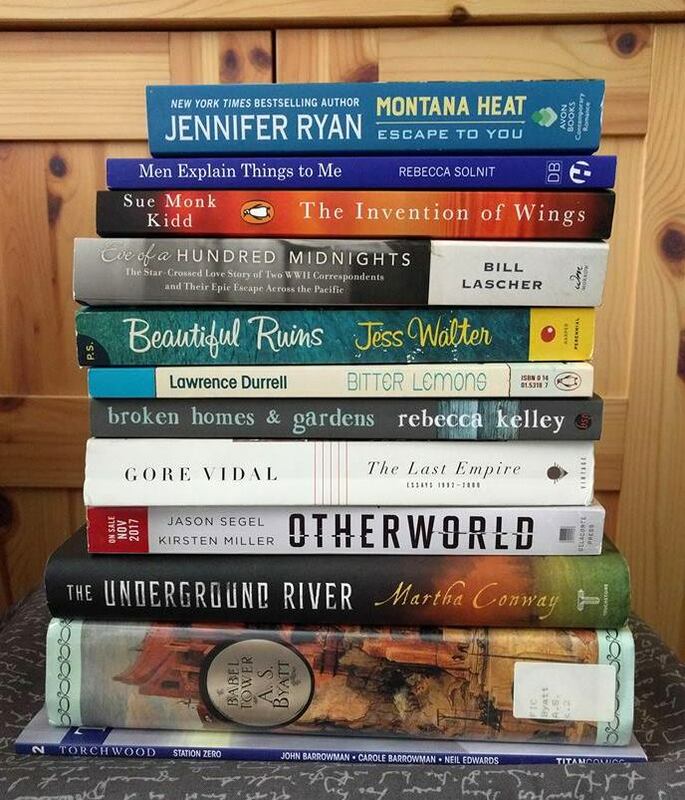 There were an awful lot of books that walked in my door during my summer break. My last Monday Malarkey post was July 18, so I have a good deal to cover. 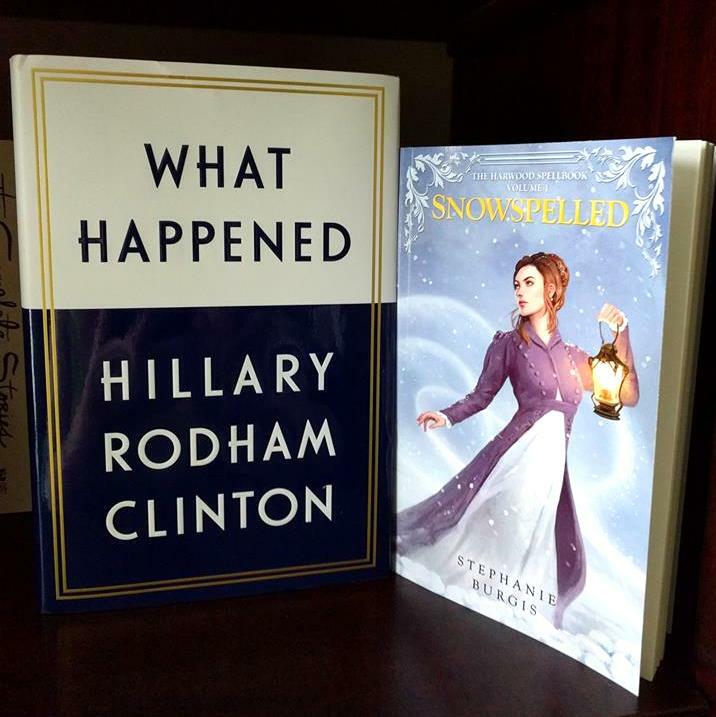 I've been reading both of these books for quite some time. While I haven't felt that "I just want to sleep all day" sensation of jetlag, I've been waking up early and going to bed earlier than normal, most days, and my reading time is in the evening. So, I find myself reading a few pages and falling asleep. Hopefully that will end soon. I'd like to finish these two and move on. After I left the blog for my summer break, I continued to write book reviews at Goodreads until I started to pack for vacation. 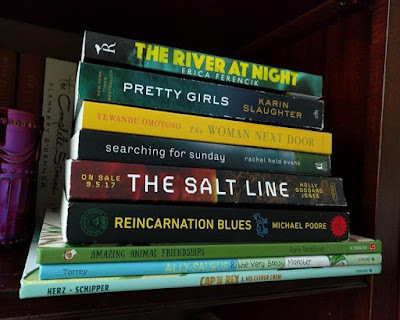 So, I will work on posting a mix of the reviews at Goodreads (which I usually alter a bit for the blog) and new reviews from more recent reads until I feel caught up. I love the feeling of stepping away from the computer for a few weeks, but the catch-up after can be a bit of a pain. I didn't read all that much, though, so it's manageable. 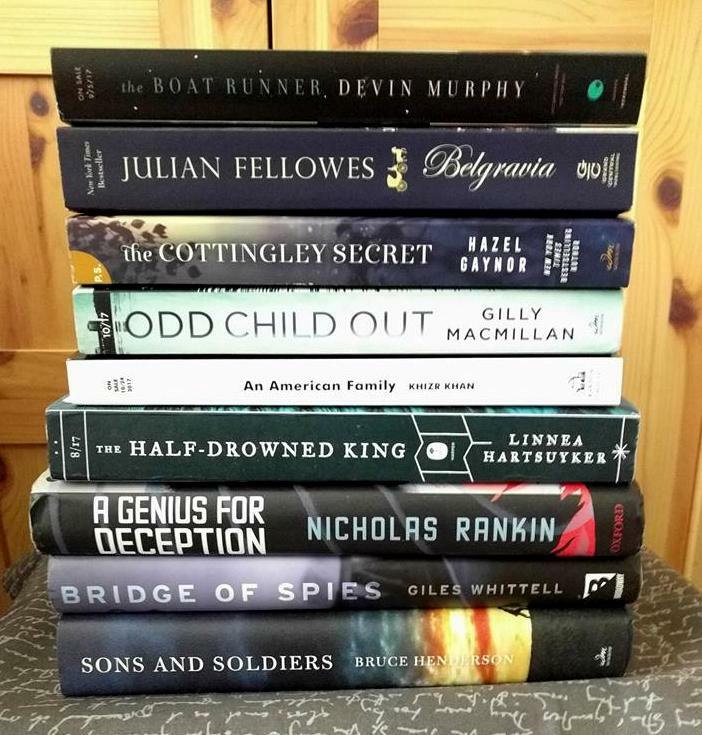 Not a great month for quantity because of a busy vacation, August was an interesting month with a few outstanding reads, some that were very good or so-so, and one that was utterly gripping but absolutely not an author I'll read twice. 72. The River at Night by Erica Ferencik - A suspense about 4 women who get together for a yearly getaway, this time whitewater rafting in rural Maine, the book starts slowly and becomes more suspenseful. Though some of the challenges faced by the women were unexpected, I found some aspects of the story predictable and the concept of four women going to such a remote location with a single guide and no backup plan implausible. 73. 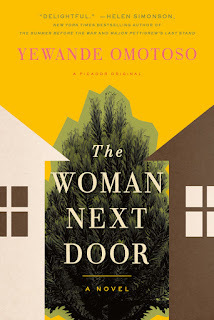 The Woman Next Door by Yewande Omotoso - The story of two women who are next-door neighbors in an upscale neighborhood in Cape Town, South Africa. Marion is white, Hortensia is black and they can't stand each other. Neither is aware of the racism and misogyny the other has experienced. But, when both have to deal with disasters that throw them into even closer proximity, they start to reveal pieces of their history and are surprised to find they have more in common than they could have imagined. Utterly delightful reading. 74. Searching for Sunday by Rachel Held Evans - A former evangelical Christian (Southern Baptist) tells the story of how she went from an extremely conservative background to drifting away and even starting a new church with friends as she gradually became more liberal and realized the scriptures she spent so many years studying spoke to her in a different way than they do to evangelical friends. I'm a former Southern Baptist with similar frustrations so I found Searching for Sunday a bit of a comfort read. 75. The Salt Line by Holly Goddard Jones - A group of adventurers in a dystopian, near-future world travel into a tick-infested part of America where disease-carrying ticks burrow into the skin so quickly that people only have seconds to use a stamp that pulls out the tick and burns the area around it. I expected a survival story but a plot twist midway turned the story sideways. A unique read. 76. Amazing Animal Friendships: Odd Couples in Nature by P. Hanackova and Linh Dao - A children's book (for ages 5 - 9) about symbiotic and companion relationships between different types of animals. The illustrations are cheerful, the spreads are a bit busy. A book packed with fascinating information, a lot of which was new to me. 77. Cap'n Rex and His Clever Crew by Henry L. Herz and Benjamin Schipper - A group of dinosaur pirates are constantly faced with challenges and their captain refuses to let them say they can't find a solution. A picture book about problem solving that I liked for its theme, although sometimes I had difficulty figuring out what was happening in the illustrations. 78. Ally-saurus and the Very Bossy Monster by Richard Torrey - Ally-saurus (a girl who likes to pretend she's a dinosaur) and her classmates are frustrated when a bossy new girl arrives and wants to do everything her way. The second Ally-saurus book, every bit as charming as the first. 79. 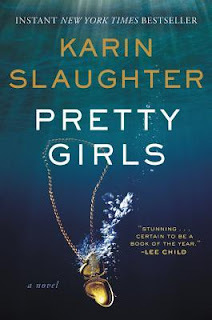 Pretty Girls by Karin Slaughter - A terribly disturbing story about a man who tortures and kills women and the search for a missing sister who has been presumed dead for 20 years. The cruelty and gruesomeness of this book was just too much for me. I will not ever read another book by this author. I did find the writing sharp and the characterization exceptional. Some of the women were incredibly witty. 80. Reincarnation Blues by Michael Poore - The story of a man who has been reincarnated nearly 10,000 times but not yet achieved perfection in any of his lives. Is he sabotaging himself to spend time with his true love, a grim reaper by the name of Suzie? Can they end up together, even though one is human and the other immortal? Both delightful and, at times, deeply sad, Reincarnation Blues takes the reader through some of the protagonist's experiences as he nears the limit of his lifetimes and attempts to find a way to spend eternity with Suzie. Loved this one. 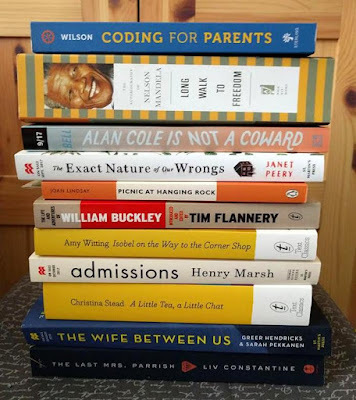 Just one big stack to finish up, although I know I have a few other books scattered about - some in my pile of finished books for August. I'll try to gather those on Monday. Not going to go completely in order because I wanted to stack the books by size and then, since I have completely hit the proverbial wall today, I didn't even manage to pile them neatly. Oh, well. I'll still start at the top. Montana Heat: Escape to You by Jennifer Ryan - from Avon Books but I think this may be unsolicited. I sure don't recall requesting a romance. I like the occasional romance, though, so I'll read it when I'm in the right mood. Otherworld by Jason Segel and Kirsten Miller - from Delacorte Press for review (maybe via SA?) - Youngest son is really interested in this one but he's got a tough semester ahead so he probably won't get to it till he has a holiday. If possible, I'll share his thoughts, though, when he gets to it. Torchwood: Station Zero by John & Carole Barrowman and Neil Edwards - purchased. And, I also have the first of this series, which I may have neglected to photograph but I just don't remember. Both were ordered so far back (about 2 years ago, I'd guess, not long after I watched the entire Torchwood series) that their arrival was also completely unexpected. That's all for today. Tired Bookfool is going to crash, maybe read a little, maybe stagger out to the kitchen and unload the dishwasher. I think two parts will cover all the books I've received during my time away. 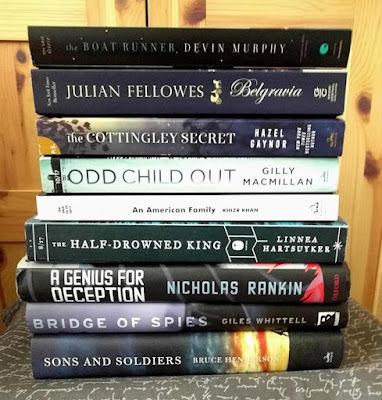 I'm including books I purchased or asked my husband to purchase and those that were sent to me by a friend and my eldest son, in addition to ARCs from various sources and they are absolutely not in order of arrival. I'm probably going to miss a few because I've read some of the arrivals. If I do, I'll gather them together in a third post. But, let's get started. You should be able to click on the image to enlarge. Coding for Parents by Frazer Wilson - from Sterling for review (my son has read a bit of this and will help me evaluate it as he has a similar book that's directed at children, which he bought for the same reason I once checked out Shakespeare for kids: sometimes the simpler, the better). Oof. I feel like I've fallen behind and I'll never catch up. But, aren't those stacks glorious? More, tomorrow! We just returned from vacation on Sunday and, of course, I've been away from the blog for about 6 weeks. So, I have a bit of book sorting to do (lots of arrivals - they just finally trickled down to nothing, this past 2 weeks) along with locating my calendar (still packed) and figuring out what exactly I read in August. When I step away from the Internet, I really step away. I didn't even log my reads, here, as I usually do. Thank goodness for the portability of Goodreads. I may have to do my usual Malarkey-type post in installments. Not sure how I'm going to work this, but at any rate, I hope to get my reads and arrivals posted very soon (starting tomorrow) and then return to writing reviews and putting up the normal posts. 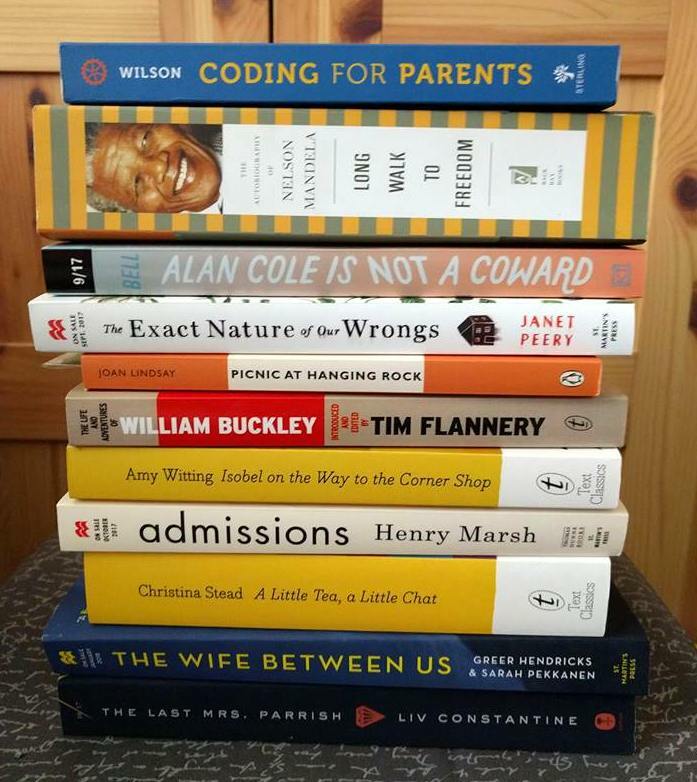 My reading suffered dramatically during vacation. We had long days and fell into bed exhausted at night so I only finished one book while we were in South Africa and finished another the night we arrived home. 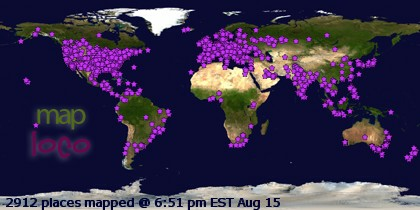 Recent stats (to be updated with the full month's reads in August, soon) . . . The Goddess of Mtwara and Other Stories: The Caine Prize for African Writing, 2017 - purchased in O. R. Tambo International Airport, Johannesburg - and there's another book I meant to buy but couldn't find on the return trip, darn it. We had three flights for the return trip (about 30-something hours of travel) and my ankles and feet always swell so badly that I have to take a day off to just rest up and let the swelling go down, so yesterday was spent trying to read and relax without falling asleep. But, I kept nodding off and dropping The Way to London on my face, which was pretty funny. We always try very hard to readjust to local time so I was fighting sleep hard. Apart from waking up at 3:30 AM, we both feel pretty normal, today, so I guess it mostly worked. We're shifting back to home time quickly. 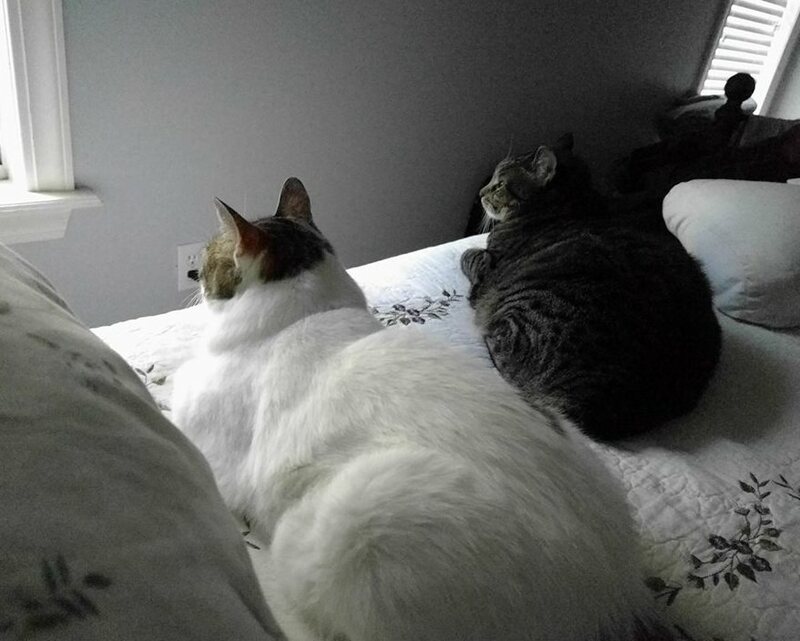 The kitties are so happy we're home. 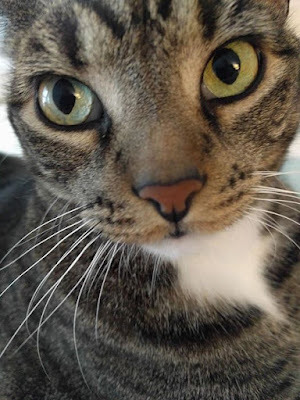 I was showered with affection (kitty kisses, lots of chattering about how happy she was to see me from Isabel, lots of rubbing and being climbed upon and a good bit of fur up my nose) from both girls but they were calm and clearly well cared for while we were away. To any Texas friends impacted by Harvey, I've been thinking about you. Having lived through Katrina and her aftermath, I understand that the recovery is a long and painful process. Here's hoping that Hurricane Irma is not as catastrophic to the U.S. as expected. Hopefully, I'll get myself organized and start posting book photos, tomorrow! How has everyone been? Read anything fabulous?